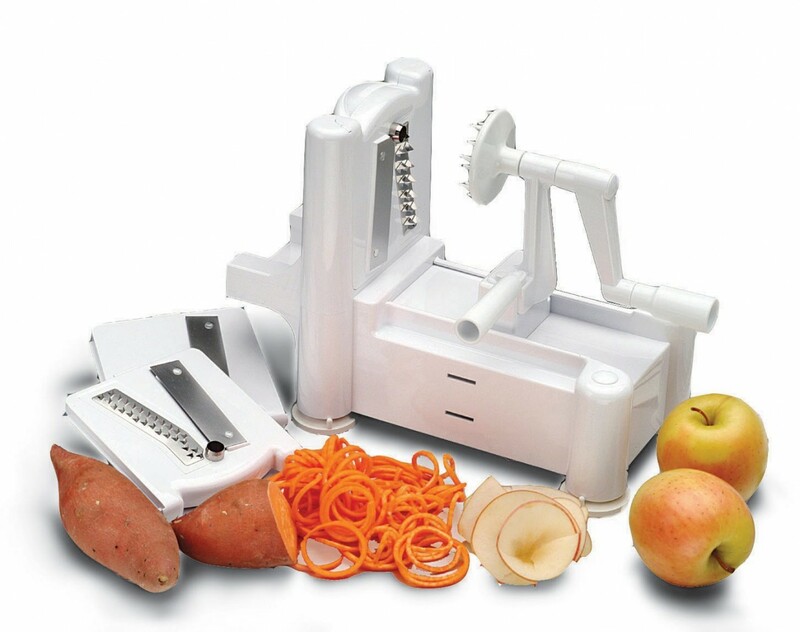 Great for making fancy spiral vegetable garnishes for salads as well as making curly fries from potatoes, the easy-to-use World Cuisine Tri-Blade Spiral Vegetable Slicer is made of durable plastic and comes with three sets of interchangeable blades. Just place your fruit or vegetable onto the prongs and turn the while pushing base toward the blade to make continuous spiral strands. It includes three sets of blades: one with 1/8-inch spacing, one with 1/4-inch spacing, and one straight blade for ribbon cuts or curly, ribbon-like slices. It measures 12 by 10 by 6 inches (LxWxH) and is dishwasher safe. Backed by a 1-year warranty. 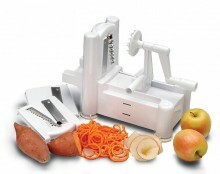 Click the button below to add the World Cuisine Tri Blade Plastic Spiral Vegetable Slicer to your wish list.